Chrome Kitchen Roll Holder. (Roll not include..
Chrome Mug Tree. (Mugs not included.).. 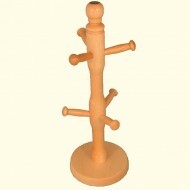 Rubberwood Mug Tree. (Mug not included.).. Chrome Utensil Holder. (Utensils not included..